People say, “The grass is always greener on the other side”, but maybe they don’t use the best lawn fertilizer for their yards and lawn. When maintaining your lawn, all you need is the ideal fertilizer for your conditions and climate and a few dates marked on the calendar. After determining the ideal fertilizer, simply apply as instructed and follow up if need be. This article will help you to get the perfect fertilizer for your lawn and provide you with a guide for choosing one. 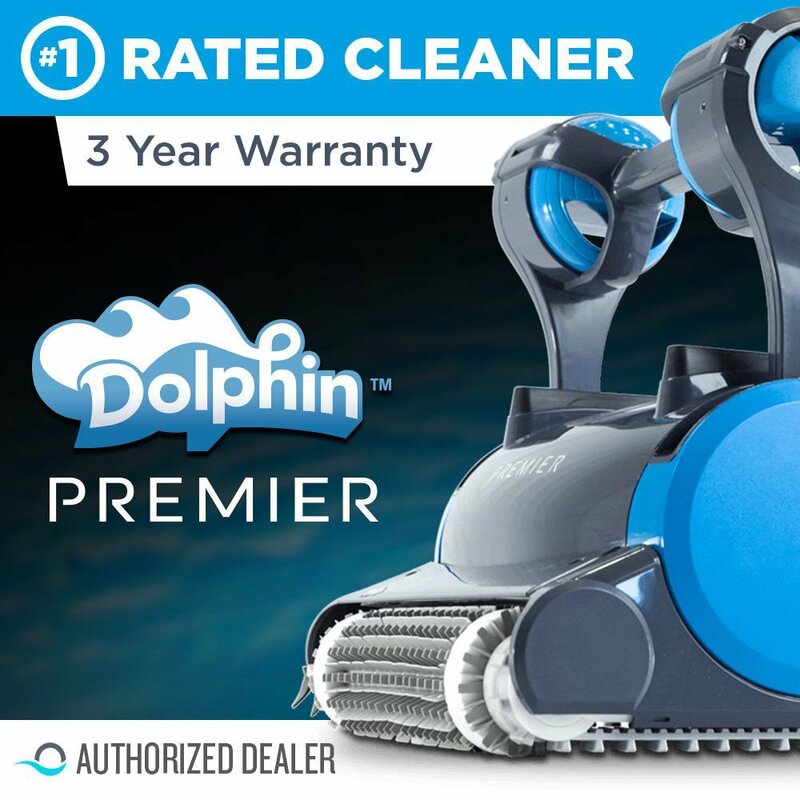 Let’s start by reviewing some of the top brands on the market today. 1.6 6. Scotts Green Max Lawn Food 5,000 Ft. Here are the top 10 lawn fertilizers that will leave your lawn green and beautiful. A green yard is a healthy place, and a healthy yard is a result of a thriving area within the soil. 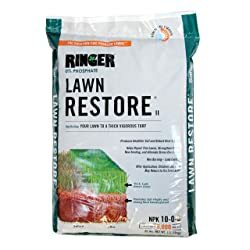 That is why Safer Brand created the Ringer Lawn Restore Lawn Fertilizer – an organic product that works instantly to provide the ideal balance of minerals in the soil. The fertilizer makes your lawn healthier and greener within 3-5 days, making it a fast acting product for green grass. What’s more, this fertilizer has been proven over time, for over 50 years, to be effective in rejuvenating a worn lawn. Its formula is the right choice for grass; you can use it to providing greening in fresh grass or bring life to drying grass. And since it covers twice the area of most fertilizers, it is quite economical and provides value for your money. As an organic fertilizer, the Ringer Lawn feeds bacteria and fungi to the soil to allow the soil to produce those essential nutrients for your lawn. 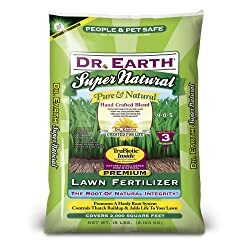 The Dr. Earth Super Natural Lawn Fertilizer contains a superior homogenous combination of fish bone meal, fish meal, calcium sulphate, potassium sulfate, seaweed extract, beneficial spoil microbes, and mycorrhiaze. These ingredients blend to form a fertilizer that that will restore dying lawn within days. 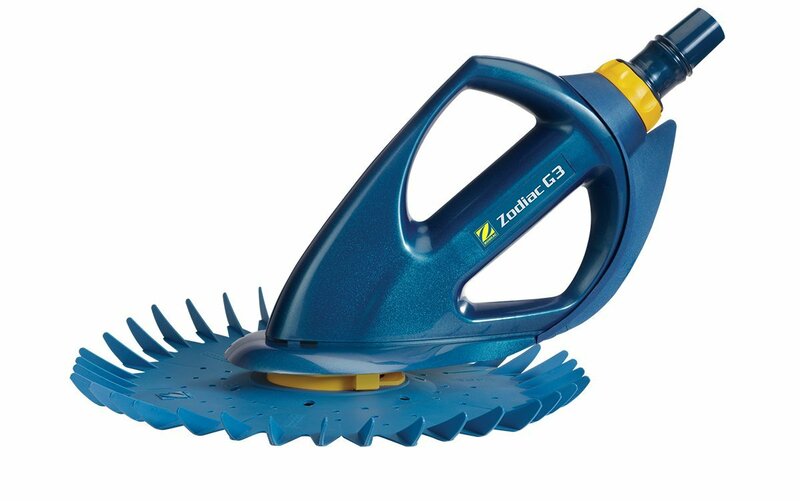 It is a superb product for most projects in your yards, including application as an amendment for planting bare foot roots, shrubs, and ornamental trees. Moreover, it is able to deter thatch development by digesting it (the organic debris produced by grass blades, stolon, and roots). In addition, it is able to promote a strong root system since it adds life to your lawn. Also, it greatly improves the quality of the area by providing the soil with the right fungi and bacteria to allow it to produce the right minerals for grass to grow. And that’s not all, the fertilizer contains mychorriza which is a key substance that grows in the soil. It also provides fast results and continuous feeding for at least 3 months. 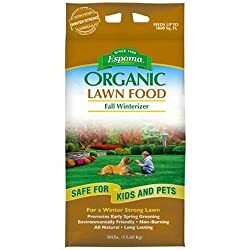 Introducing one of the best organic lawn fertilizers you will get on the market today: Espoma EOFW30 Organic Fall Fertilizer. This is an affordable product that will provide the minerals your lawn requires to grow in a healthy way. 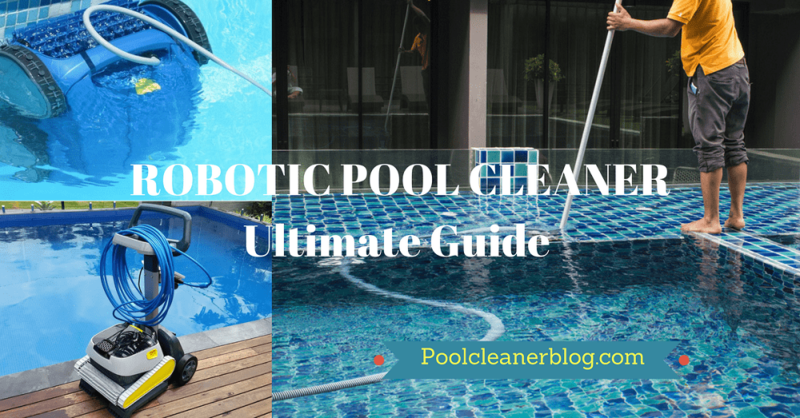 It is also a chemical-free product that you can use in an area that is often visited by people and pets and not worry about experiencing any problem. Every 30 p0unds package is specially made to maximize the health of your lawn and will offer 2½ times more slow release of nitrogen than most fertilizer today. The product is made of sulfate of potash and feather meal poultry manure, two of the leading ingredients for making fertilizers. Extra potash comes in handy to allow your grass green in the next spring with ease. And this package is able to feed at least 5,000 sq. ft. since it is an economical fertilizer. Its application process is also very easy and you don’t need a professional to that for you. Do you want to build a green and thick lawn naturally? 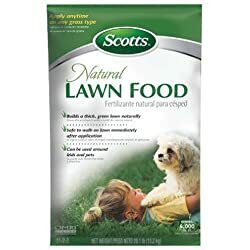 The Scotts Natural Lawn Food is the fertilizer for you and will provide you with your desire within days. It is a fast acting product that you can apply to your lawn and wait for it to get green and be more attractive. The best part, it is a safe product that you can use in your lawn and allow people to walk on it. This means that it won’t hurt people or pet after application. Another thing, you can apply it any season to all types of grass since it is a universal product. Just to show you how reputable it is, the fertilizer is OMRI listed and will restore all the worn out parts in your lawn. So, you can rest assured of having a better lawn when you apply the fertilizer within days. Its application process is also very easy and you cannot get affected by it. Liquid fertilizers are one of the easiest products that you can apply on your lawn. This is especially true of the Simple Lawn Solutions Advanced 16-4-8 Balanced NPK Lawn Food. It comes with the right blend of major macronutrients and fish and seaweed. It also contains high-quality natural and organic feed grade ingredient that will nourish your grass to healthy with pure and safe liquid nutrients. 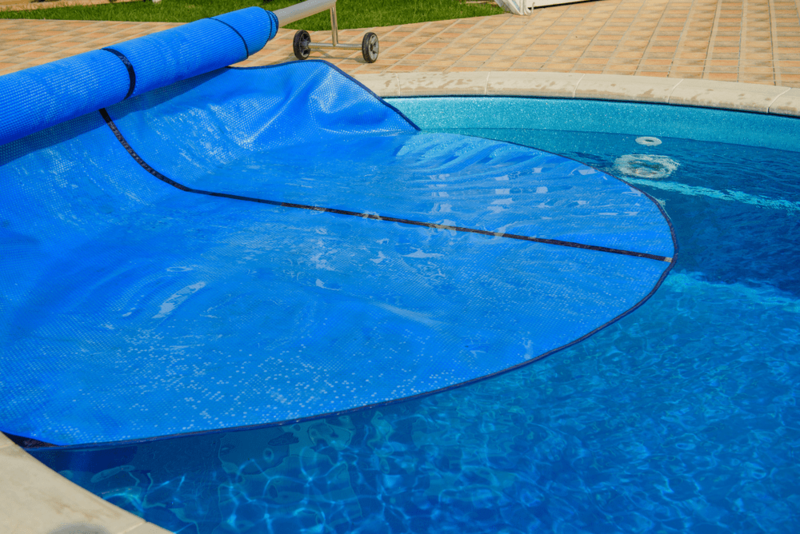 This means that it doesn’t contain any harsh chemical that can cause stress to your yard. The fertilizer was designed to be used easily and comes with a spray bottle. Moreover, you don’t need to mix anything since it comes ready for application. It is a complete NPK product that will give your lawn greening as well as growth it requires to look stronger and healthier. So, no matter the type of grass you have, you can use this product to ensure that it remains in top condition all season long. 6. 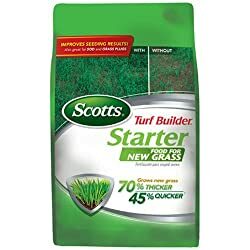 Scotts Green Max Lawn Food 5,000 Ft. 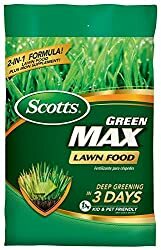 Yet another fertilizer from Scotts Green that has made it in our list of the top 10 fertilizers for the lawn is The Scotts Green Max. This product provides the right nutrients to your soil for deeper greening in three days. 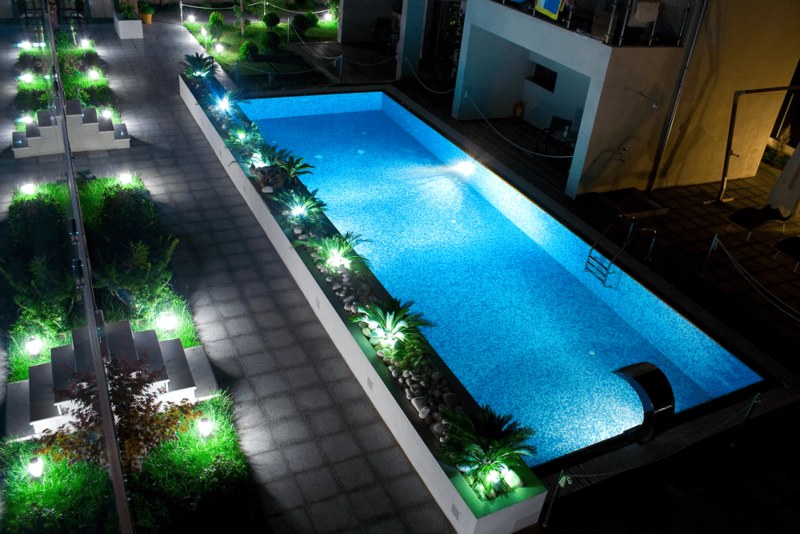 Hence, it is a fast acting product that will transform your yard within days. Moreover, it is a 2-in-1 product that supplements and feeds iron to your soil to make it more suitable for growing grass. Another thing about this soil is that it provides thick grass that is able to fill all bare spots on your lawn. Thus, you can have peace of mind knowing that all your lawn will be covered with grass when you use this fertilizer. It also provides greener and thicker lawn than most fertilizers out there. 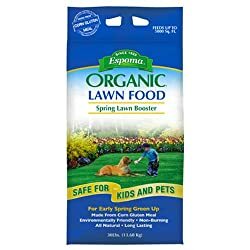 And just like all fertilizers on this review, it is a safe product that you can use in places that are visited by pets and kids. If you have ever heard of Espoma, then you know that it is one of the leading firms for producing lawn fertilizers. This time we look at its EOLB30 Organic Lawn Booster Fertilizer that has been transforming lawns for years. The fertilizer is made from gypsum, pasteurized poultry manure, and feather meals, making it a 100% organic fertilizer. There is no chemical added when making it. 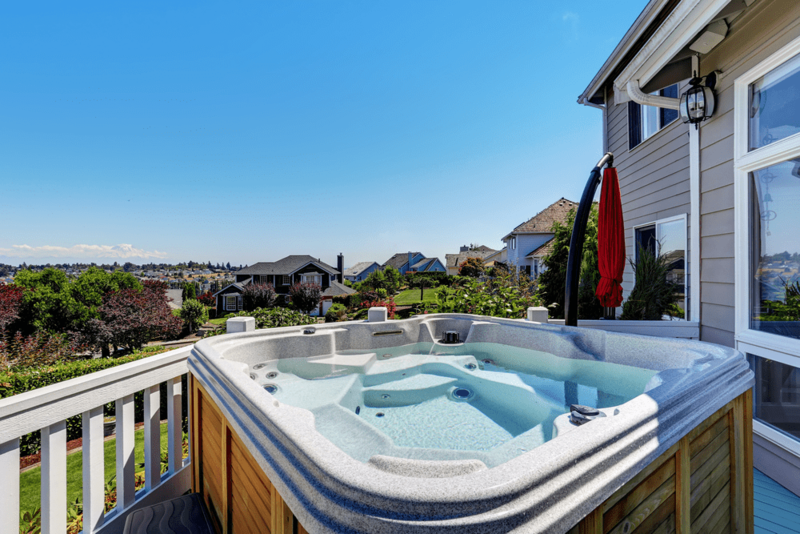 Thus, it is a safe product that you can apply and let the kids and pets play on the grass immediately. Coming in a 30 pounds package, the fertilizer goes a long way to cover a huge area of your lawn and is 8-0-0 formulated. In fact, it usually covers at least 5,000 sq. ft., meaning that you will get value for your money when you use this fertilizer. In addition to being safe, the fertilizer is environmentally friendly and it won’t harm the soil or grass in your lawn. Scoots are committed to providing an attractive lawn that every neighbor will fall in love with. 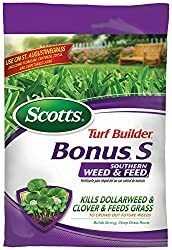 One of its best fertilizers today is the Scotts Turf Builder Bonus S Southern Weed and Feed and restores your grass color within days. Made for actively growing weeds, this fertilizer will not only feed the grass but also kill the weed and turn them into feed for the grass. Actually, it kills dollarweed as well as other listed lawn weeds that can harm your lawn. It also strengthens against drought and heat while feeding the lawn to make it withstand these tough conditions. Note that this fertilizer is only for use on Centipede, St. Augustine grass, Carpetgrass lawns, and Zoysia. Regular feeding your grass with this fertilizer ensures that your grass will look in top condition and withstand all the stress of heat, drought, family activity, and weeds. It is also a safe product that you can apply today and use your lawn immediately. 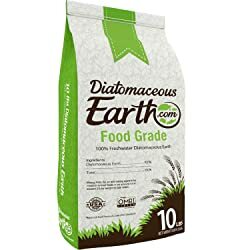 Diatomaceaous Earth was obsessed with creating the purest fertilizer food for your lawn and this is why it came up with the DiatomaceousEarth Food Grade. The company tries its best to ensure that it produces a high-quality fertilizer right from the moment it gets the ingredient to the production and to the provision of the fertilizer. It is good to note that this is the only company that provides an official supplement that fulfills all requirements of lawn supplement in the United States. This fertilizer is certified by the Organic Minerals Review Institute, making it a trustworthy product that you can use on your lawn. 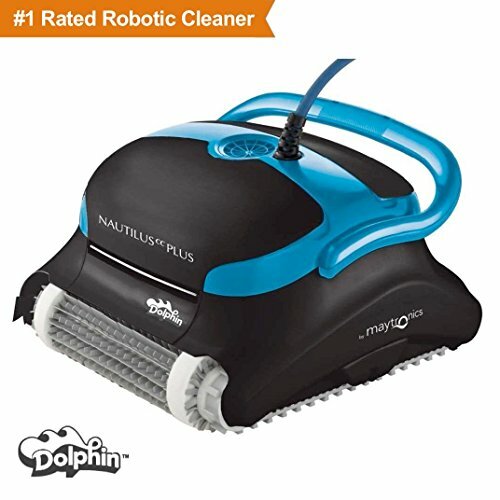 What’s more, you can use this product for other uses such as pet care. 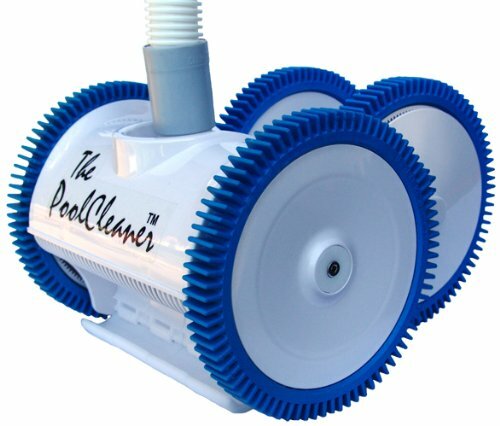 So, you won’t just need to use it on your lawn but also other applications that are listed for. Another thing, it is a very affordable product that you won’t need to use a lot of money to get and even apply. The Scotts Turf Builder Lawn Food is able to grow new grass that is 70% thicker to ensure that it covers all the bare areas on your lawn. Moreover, the grass is able to grow 35% faster when you compare it to other fertilizer on the market today. 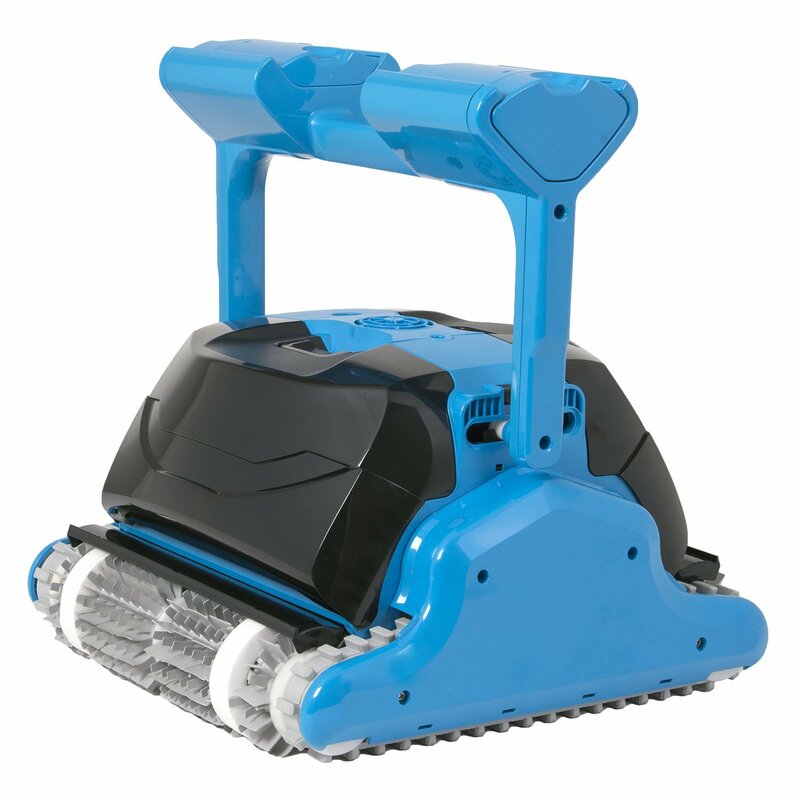 It is also able to provide new grass with the energy it requires to get off to a healthy start by promoting blade development and faster root. Another feature of this fertilizer is the ability to improve seeding results and is also amazing for grass plugs and sod. Its 24-25-4 fertilizer ratio offers the perfect nutrient balance that helps your lawn develop better. And this fertilizer is ideal for use for all types of grass and in any place. So, if you want a fertilizer that is known to provide the right minerals to your soil, this is the fertilizer for you. It will easily transform your lawn within days to leave it more attractive than before. The best way to determine the amount of fertilizer you will require is to determine the surface area of your lawn. Measure the length and width to compute the square footage. If you cannot do this, then try to guess the area as accurately as possible. As a guide, every 8 steps are roughly 10 feet of space. Walk from one side to the other on the width and length. For triangle lawns, determine the width and length of the triangle. Multiply them and then divide them by 2. For circles, find the center and then walk out of the circle to the edge. Multiply by 3.14. Q: Is it necessary to add fertilizer to places with sufficient rain? A: Yes. Fertilizer is meant to add minerals to the soil and not moisture. Hence, you should add fertilizer to your lawn no matter where you are located. However, ensure that you get the right fertilizer for your area and lawn. Q: When is the right time to fertilize a fresh/new lawn? A: You should fertilizer your new garden after planting the grass seeds using a beginner or starter fertilizer. This fertilizer will provide the required nutrients to ensure that the grass grows healthy and strong. Q: How regularly should I fertilize my lawn? A: This will depend on the kind of grass you have. Warm-season grass should be fertilized 3 times during growth periods (not midsummer) while cool-season grass should be fertilized in November, September, May, and April (4 times). Q: How should I fertilize my yard? A: Choose the ideal fertilizer, know the level of minerals required, and then apply during the right time. Q: How much fertilizer should I apply? A: The recommended rate is 1-pound of nitrogen/1,000 sq. ft. of lawn. Hence, know the amount of nitrogen present in your fertilizer and then know how you will apply it. Q: When should I lime my lawn? A: When you determine that your lawn is highly acidic. Lime adds calcium to the soil to neutralize it, thus raising its pH. The best lawn fertilizer will come in handy to ensure that you get a fresh lawn that will be attractive to all people. When getting your fertilizer, make sure that you know the type of fertilizer you need for your lawn.